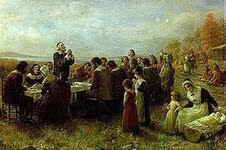 In the year 1621 when the Pilgrims celebrated that first thanksgiving, they had no idea that we would celebrate that same Thanksgiving today, almost 400 years later. But, here's the question, "Why do we still celebrate Thanksgiving, and what is there to really be thankful for?" And just what was the deal with the "five kernels of corn?" In this special Thanksgiving program, we will take a look at a time in history when there was not really much to be thankful for in America, and at a people we know as "Pilgrims", who had almost everything going against them. Question: Will we leave a mark in our history worth remembering?